Are you constantly losing your belongings when your hands are full of luggage? Do you want to keep your cards safe without anyone noticing? 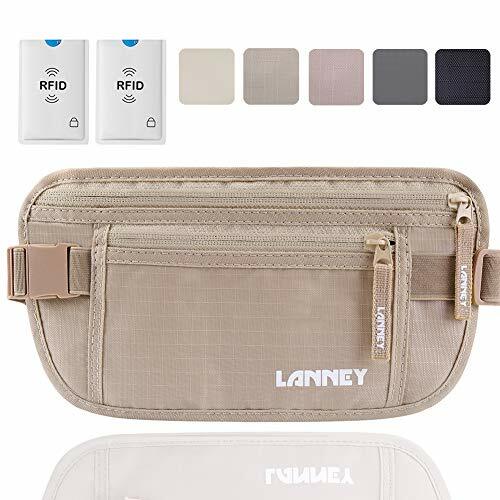 LANNEY travel money belt is what you need for hands free, zero stress travels. RFID chips are commonly used in passports and credit cards. Electronic pickpocket can simply scan your personal information without your realizing. The money belt professionally creates RFID shield. You'll still get calls and texts, but you don't need to worry about identity theft. 2 large zippered pockets and 1 rear hidden pocket provide ample storage to organize all precious documents and personal items. The largest front pocket includes two internal mesh compartments which allow you to separately arrange your money, coins and credit cards. No more rummaging through your bag. WHY CHOOSE LANNEY MONEY BELT? ※ LANNEY has been a provider of safe travel wallets for years. ※ Ergonomically design. Perfect for hiding under clothes. ※ Slim sleek design. Invisible to thieves. ※ Water-resistant, 210D rip-stop nylon. ※ Breathable mesh back panel. Moisture-wicking. ※ High quality zipper. PP ribbon for zipper. ※ Waist band can be adjusted in length for a perfect fit. ※ Elasticized strap fits both women and men. Waist pack for jogging, running, cycling, and other outdoor activities. Perfect gift for all travelers, students, hikers & outdoor enthusiasts. Money belt Weight: 0.17lb. Dimension: 10.2"x5.5"x0.08"
Join the thousands of our satisfied customers! The promotional time is limited!